Today I am sharing the book that started my guilty pleasure when it comes to reading. I love a good romance novel, especially if it is a historical romance! 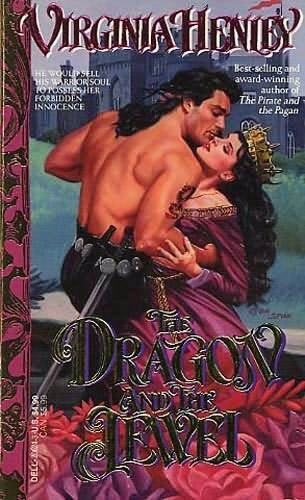 The very first romance novel I ever read was The Dragon & The Jewel written by Virginia Henley. At one point in time I actually owned all of her books, but this one was one I always went back to over and over again. I also think that this was the book that started my love of medieval history! I had to go back and change my design with this book because I found out that I don't own a dragon image! There was no way I could free hand a dragon so I went in another direction. The base of my design is two coats of Milani Hipster Plum. I went with this color because it has a very royal purple feel to it. The main part of my design was inspired by the scroll work on the side of the book. I went with an image from PUEEN33 because of the hearts, it is a love story afterall! I used Essie No Place Like Chrome with the image. As an accent I added a crown and jewel using Essie Good as Gold, BM08 and 09. If you are looking for a good summer read I highly recommend The Dragon & The Jewel! What's your guilty pleasure when it comes to reading? Awesome mani! My go to books are along these lines! You did great on the manicure! Gorgeous! Love the purple shade!!! Your stamping is always flawless!! What is your secret?!?! I really like the design you came up with! Absolutely beautiful!!! I'm intrigued by the story line. I'm going to check this book out this week when I go to the library.